I read a few threads about people wanting SHP Builder remade. Today i dediced to re-make the basic SHP file loading code. The example app will only view the SHP files (And it only supports TS/RA2 ones). At this stage idk if i will do any more work on the project. But at least there is cleaner code for loading SHP files. I also designed the class to be more friendly to an editor as it stores the Palette Version and RGB Version at the full size (RGB version to reduce rendering overheads). // Code above this line taken from SHP_File.Pas which in turn was taken from XCC. // Make Black and White Palette as fallback! NOTE: "FreeMem(Image_Headers);" is missing from the end of LoadFromStream which would cause a small memory leak. Anyone have any TD/RA1 SHP's that i could use to test TD/RA1 SHP loading code? I guess you could try Lin Kuei Ominae's "Iowa Class Battleship" shp. BTW why did you write this in Pascal? 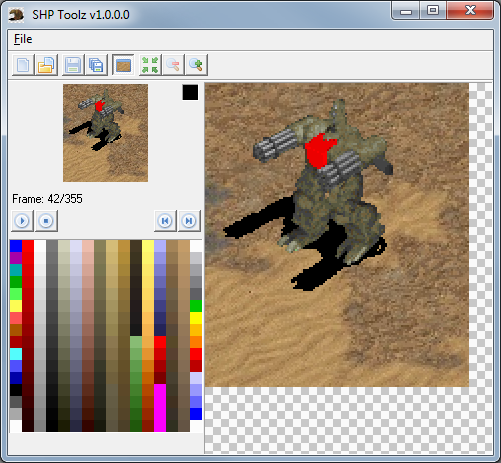 no, that is SHP (TS) format too, because SHP Builder corrupted the file when i tried to save as SHP (TD). Hello Stucuk, it's great to still see you around and even greater that you still spend some time in improving the tools. Currently we have no batch processing SHP tool. So how about making SHP Toolz useful beyond a testbed for the new code? This is cool news. All I can really contribute is by giving thumbs up and encouragement for proceeding with this rewrite of the SHP builder! Delphi is the language i am most proficient in. It also allows for easy RAD (Rapid Application Development) meaning making a front end is simple. I don't see the point in writing a C++ application for the sake of it being in C++. No one would contribute to the project anyway (C++ has no advantages over Delphi other than their being more people with a copy of C++). @Lin Kuei Ominae: Thx. What do you mean by the canvas optimization? Just shrinking the overall width/height to the minimum size? yes, making the canvas as small as possible. Many people render with 320x240 or bigger sizes, while the actual object is quite small. 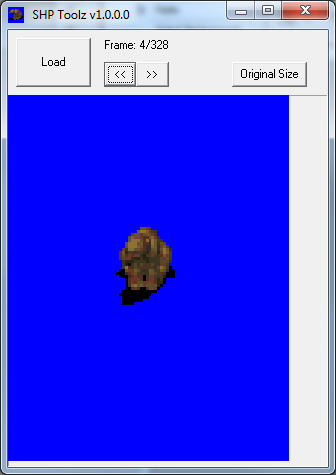 And a small canvas is surely also better for the games engine, which then has to calculate a lot less. Currently you have to find the outer most pixel of all frames and then shrink the canvas accordingly and finding the smallest bounding box is quite tedious especially on SHPs with many frames. Why don't you convert it to Lazarus? It is also pascal and it should allow more people to work on it, without spending a penny. Got $80 decoding working though i cheated (Currently just using the decode80d from SHP Builder's code rather than a re-write). Unfortunatly the MCV doesn't have $20 or $40 compression in any of the frames. @Lin Kuei Ominae: It should be very easy to achieve. With TS/RA2 SHP files you already have to work out the smallest size for each frame which could then be used to work out the smallest canvas size. Though as it stands i haven't written any saving code, only loading. 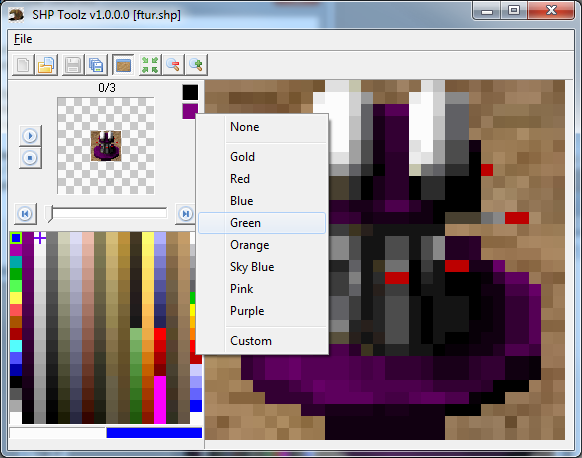 P.S Technically shouldn't be hard to add to SHP Builder but im not touching it. Way too bloated. @Banshee: True that it could be converted to Laz but i wouldn't personally do it as i don't use Laz myself. Also i doubt it would increase the chance of anyone contributing. Doing it in C++ has a lot more point then Delphi. No one besides you two ever touched SHP Builder because of the language it's written in and no one really will touch this. From personal experience every single Delphi app i've ever run has speed issues,memory leaks, crashes for no apparent reason, with SHP Builder not being a exception. @tomsons26lv: Utter rubbish. Delphi actually has FastMM with modern versions(And it was a free download before it became the standard Memory Manager) which has facilities for tracking memory leaks, etc. Memory leaks are common in EVERY language(You either have never ran applications or never played any computer games as most leak and aren't made in Delphi) which doesn't automate pointers. Languages like Java and C# have garbage collectors which handle pointers for you (Which can be bad). They can still have memory leaks however (The Irony). The way to prevent memory leaks is for there to be a competent programmer. SHP Builder never used FastMM and both I and Banshee were not the best in the world at programming at the time. Speed Issues and Crashes have nothing to do with the Language. Delphi applications are compiled into Machine code, the actual compiler is a C++ compiler modified to work with Pascal Syntax (C++ Builder's Compiler is the same as Delphi's except it can also handle C++ syntax as well as Delphi in the same application). In re-guards to having it in C++ meaning more contributors, you just need to look at the C++ projects (For CNC), they don't get a massive amount of contributors. 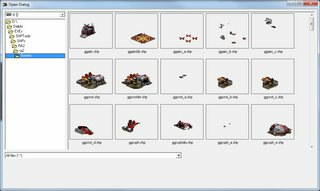 Have you even ran SHP Builder (See credits)? SHP Builder's code being a complete mess is going to be more of a reason why more haven't contributed(I don't even want to touch it and i invented it). What language is used for a real programmer is irrelevant when it comes to contributing. Also VXLSE was programming in Delphi (I never invented it. I only contributed to it with VXLSE 2 after 3 others had worked on it. I re-wrote it for VXLSE 3 and Banshee contributed after a while). Anyway please refrain from bitching about what language I want to program applications in. All it does is annoy me and i won't have this thread derailed by Bull. P.S C# is meant to be Delphi and C++ merged as the guy who designed Delphi designed C#. And for the Record when i attach FastMM to SHPToolz as it stands its not leaking. I am sorry stucuk, I did not know it would cause an uproar to ask. I can say it doesn't matter too much what language it is, for the most part I can kind of tell what is going on, and I guess that is all that matters. Stu, do you wanna a SVN repository at PPM for SHP Toolz? It doesn't. In the early 2000's we had the C++ Fanboys spreading lies (Either deliberate or through ignorance) and i cba with that bull. Nothing wrong with people suggesting languages (along with positives and negatives) but there is however an issue when people lie and state that Delphi just causes memory leaks, crashes, slowdowns, etc (All 3 have nothing to do with the language used). Iv been programming for over 17 years, so i know Bull when i hear it. what could be considered "best/better/good"
It depends on what your doing and what your goals are. For general stuff you can use most languages but for specific stuff like say writing a game for an XBox you would have to use a specific language. All languages are basically the same. The Syntax is just slightly different with each. Unless someone actually wants to contribute a SVN is pointless. Though thx for the offer. 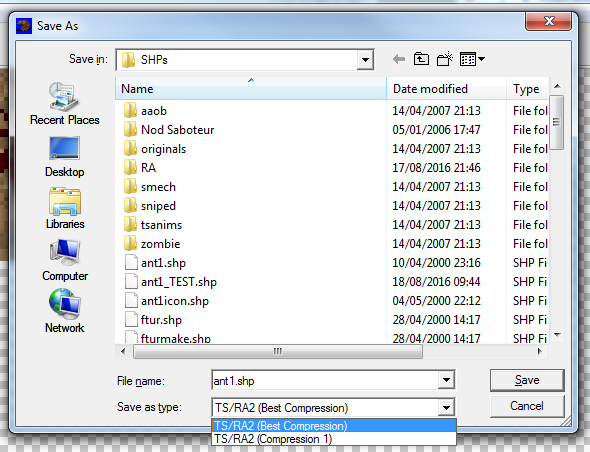 Got TS/RA2 SHP Saving done(Unlike SHP Builder it will compare all 3 compressions and pick the best. Though in reality Decode3 should always win). I haven't got TS or RA2 installed so i can't test it (IIRC TS wouldn't run on Windows 7 when i tried it last year). mouse.shp which doesn't work with compression. (i.e. to use only compression 1 for all frames). TS runs on all Win7, 8.1 and 10 too. Looks like the Issue is MS15-097 disabling secdrv (SecuROM). Technically Compression 2 should win if your SHP has alot of holes in it. Comp 2 stores all the pixels in a row from the first pixel to the last non-background. Comp 3 ignores the background (Using 2 bytes, one to indicate a 0 and another for how many pixels to ignore). Since 3 uses 2 bytes each block of background its worse if there is alot of holes. though it might be disabling the CD check the same way. I know that, sorry, shouldn't have made this post while being distracted and tired. It's not the language, its the components and libraries that come with it, from the experience i have had every time something goes wrong in a Delphi app that's where it mostly happens, and from what i understand people are forced to use as there aren't really much alternatives. Even if you get VCL's and RTL's and whatnot it has that don't have issues, since you don't see the point in converting to Lazarus, there's still the matter of the price, €392.04 for the Starter(which i'm guessing without the Library sources is useless) and €1,955.36 for the Professional version is enough for people to instantly lose any interest whatsoever on the sight of Delphi in general. - Delphi IDE is awfully bugged (at least in the 2006 version, which was the last free Delphi [Turbo Delphi Explorer] released). It crashes after using for some hours due to memory leaks. But that's an issue with the IDE and not the VCL. Other versions of the IDE may not necessarily have this problem. I know that compression 2 is never saved by SHP Builder though i am not sure if it was simply as compression 2 doesn't often give a better compression or because TS/RA2 don't support it (Way too many years ago). My "Best" uses each of the 3 compression's (Comp 1 doesn't actually do any compression and is used as input for the other two), gets their size and picks the smallest. I have added a "Best Half" option which does "Best" for the first half and comp 1 for the rest. I can't speak for Delphi's after version 6, but i haven't had any real issue in re-guards to memory leaks or crashes (Delphi's IDE has always had issues if you run the IDE for long enough though Version 6/7 has meant to be one of the more stable versions). Standard VCL's only flaw is speed when it comes to things like adding loads of elements to a TreeView/Listbox/etc as it uses the windows API. However there is VirtualTreeView (Free VCL component). The good thing about VCL is that if you don't like a component(Say you want custom drawing code) you can easily write your own to get around any issues you have (Sometimes just subclassing it and overwriting some stuff is all you need). Anyone can convert to Lazarus, why would i have to be the one? If someone actually wanted to contribute to it but only if it was Lazarus they would take the code and convert it. The whole concept that only if someone else does the work that people would contribute is a fantasy. All you need to do is find a copy of Delphi 6/7 Personal Edition (Which was released for free) and a Key for it. Granted you would need to check any files you download with a AV checker since it wouldn't be from the official source (As they removed the download years ago). Only an issue if you need to access more than 3-4GB of memory (Im not sure of the exact limit). Unlikely to be an issue with any CNC project given that TS/RA2 are 32bit apps. Most things have a DLL form. Alot of DLL's have delphi headers and for those that don't there are multiple applications designed to convert C/C++ headers to Delphi (Which generally only need minor changes to get them to compile). Yes. Though Delphi 6 works most of the time with the 2 Patches applied. Occasionally has a fit which either requires the project to be reloaded or the IDE to be closed and restarted. But you can generally run multiple copies for long periods of time before any issues. 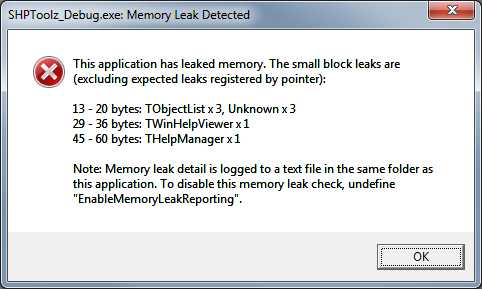 I haven't noticed any memory leaks with Delphi 6. Bound to have some (Most apps do) but never been an issue for me. Anyone can convert to Lazarus, why would i have to be the one? Maybe... because.... you have the most up to date code and that you've just started the program recently (which makes the conversion procedure be much easier than in later stages)? No one has stated they would help if it was in Lazarus. The whole "If you make it they will come" is a load of rubbish. I know from personal experience and by looking at other CNC tools (Which aren't made in Delphi) that people generally don't contribute to a project. Most want to make their own projects if they do anything. Lazarus can convert projects doing the majority of the work for you. Most of the main code (Such as the SHP file stuff) would not be tied to Delphi in any way and should have 0 issues being used in Laz/FreePascal. People have converted Quake 3 to Delphi, etc. Which is a far greater challenge than running Laz and fixing some minor code differences. Both are pascal based and Laz is designed to be a Delphi replacement (Unlike C/C++ which are completely different languages). If people are too lazy to run Laz or don't have the skilz to fix some minor issues (If any would even exist) then they likely wouldn't be of any use contributing. Its not rocket science, i just don't want to waste my time on a laz port that noone is even going to contribute to. Bottom line is this. I am going to program for as long as its fun (The BS about how i should do it in Laz/C++/Etc when no one is going to help is just annoying. "Do it in XYZ Stu!!!!! But i won't bother to help you!") and then i will go and crawl back to the rock i have been living under. I'm spending more time writing replies to the BS than i am coding. You have done nothing wrong. The issue is people telling me what language i should code in who are not going to bother to help if i did what they said. 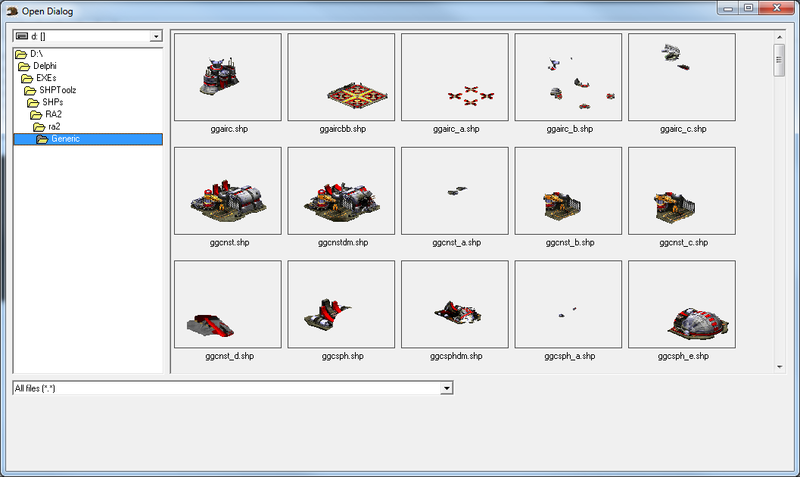 The whole concept of what im doing is really to make a unit that can load/save SHP files which is clean and simple (Not a complete mess spewed over multiple files like SHP Builder). 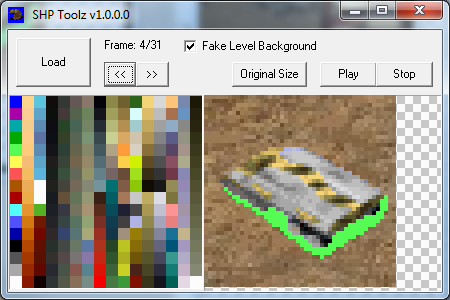 Also one where its coded in a better and more fast way (Like BuildFrameRGB's code). That unit could then be used in any application (Even a simple console application, doesn't need to be a full fledged gui) to do whatever people want to SHP's. Could even make a DLL project giving easy access to SHP's for any language which supported C style DLL's. In the Original you click the window and it will use that as the maximum size (It scales it proportionately). In the latest it has Zoom In/Out buttons with 1x-20x zoom (1x, 2x, 4x, 6x, 8x, 10x, 12x, 14x, 16x, 18x, 20x). As it stands it still has no editing capabilities. Included is Both the Release version and Debug. Debug has the memory manager report memory leaks. It will always state their are some leaks though in reality they aren't. They are things which are only ever created one time and are designed to be "Alive" for the entire run of the application (Thus freeing them isn't important as they are only created once and all resources are free'd by windows when the application closes). Memory Leaks are only where your losing memory each time you perform an operation. The Memory Manager has no way to tell if they are true leaks or not. They are False Positives. I have implemented a Extra Header in the SHP.Pas which will save the Palette, Game and SHP Type to the end of the SHP file. 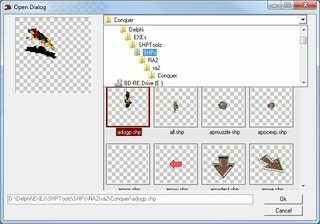 The idea being that published SHP's could be downloaded by people and the editor would not need the palette the SHP was designed for and would know how to handle the SHP. I havn't tested but it shouldn't be an issue for the games since its just added at the end of the file. Its adds 778 bytes to the filesize. Currently there is no way to set the Game/Type. Implemented the Side Colours. The way the system works is that the actual palette is untouched. When anything requests the palette(Such as drawing a frame) it returns a new palette which has the Side Colours updated (Unless None is set). 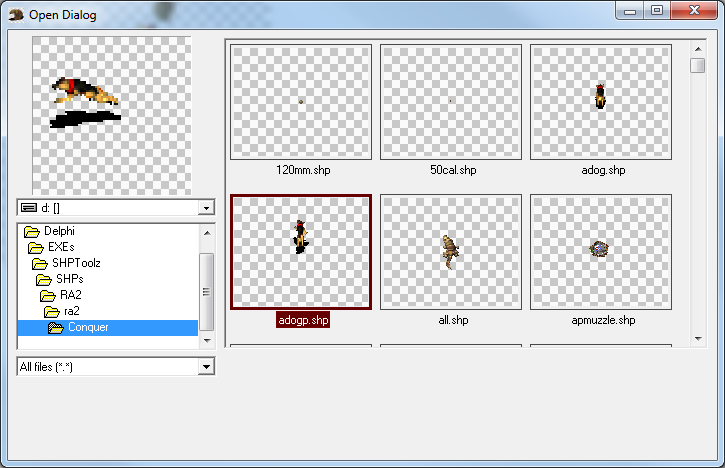 Also added a "One Frame Load" option to the SHP class which will be of use with an "Open Dialog" idea i had. Heh, well it might present a issue ingame actually, it needs to be tested, you might be able to get away with it with TS/RA2, TD to RA1 is a lot less probable. 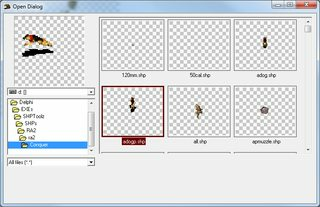 The Shape formats can actually have a palette in them but Westwood never used this in any game files, probably just a conversion tool thing. Dunno if the game handles it or ignores it. Not 100% sure but iirc TS had that too. sint16 Allocated;	//is treated like a bool. Dunno where my notes on the TS format are all i found right now is my headers collection txt. // meaning not just compression can be defined but other variables that affect how the SHP is drawn ingame. Fun random fact, Blade Runner actually introduced another version of Shape format, which was the last one to my knowledge, the SHPs there are 24-bit or even 32-bit, dunno about that. There are others mentioned throughout the web like Format20, Format5, Format64, Zero-Compression and whatnot and others, gonna try to connect the dots to the debug build symbols i have. Format20 is just XORDelta, the difference is just how it's applied. Unless it checks the file size (Which there is no reason to do so) it won't be an issue. SHP's don't have a CHUNK style system. Compression is meant to be a single byte with the other 3 being "Align". At least according to SHP Builder. Its unlikely compression is a flag since it uses 3 to specify a compression (Bit flags are just true/false for each bit, 1+2=3). Is it confirmed that RadarColor is RGBA? Why would it need Alpha for a radar color? TMP's look odd. At least how SHP Builder loads them. The way to work out the offsets just looks horrible (Well to know how many there is). Oh it does, in the first gen C&C Engine(which is what its called btw ) the Delta(what SHP Builder has as MaxFrameSize) specified in the header is used for memory preallocation for the shp for decompression, if it's horribly wrong the game might crash actually, seems the radar.shp because of the frame amount and resolution of them is prone to this, we discovered this while we were working on getting proper compressions working for RApp. Compression is meant to be a single byte with the other 3 being "Align". At least according to SHP Builder. It's unlikely compression is a flag since it uses 3 to specify a compression (Bit flags are just true/false for each bit, 1+2=3). If it is Flags, it's not just a byte, it's all 4 bytes. Well turns out it's not just me that has a suspicion of that that in TS SHP format are Flags, Blade thinks it could be too. Irrc some TS/RA2 files have 255 there, think it were the rocks. No clue, seems it's obsolete. I just officially confirmed one of the TS compressions is RLE, it's funny how, i checked WWs TS/RA2 ShapeSet which i have and keep forgetting about lol. But that should have nothing to do with adding extra data to the end. My understanding is that "Delta" its just the buffer size used to decompress the frames (As in the output buffer). The other 3 bytes could be flags. It just doesn't make sense to have 1,2,3 as values if the first byte was flags since Bit 1 + Bit 2 = 3. With flags you have each flag being a separate bit. Wouldn't that be compression 3? It is kinda RLE except it only does it with pixels that are the background colour ( 0 ). eh bit sleepy, nvm then i guess. Guess i need Blade to explain how WW did the Flags part then. Yea seems that is it, its RLE Zero. The ShapeSet i have seems is dumbed down, the main function has 26 switch cases but the main function has actual code for just 9. These are noted down as i encountered them for the first time, after that i didn't make note on the same ones. 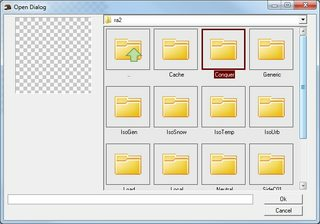 Only checked conquer.mix and generic.mix so far, but they aren't unique to the files above, a lot of them are used in quite a few SHPs. null and c_shadow have CC CC CC CC, i think when set to that it affects how its cached/stored in memory given the nature of both files. Zero? isn't zeros either, extra flags maybe? c_shadow has CC CC CC CC there. Alpha is CC in c_shadow as well. - Distorted frames in both normal and shadows. Probably because of bigger SHP dimension. - Compression 2 frames are distorted. to handle compression 2 and it crashes. in TS only, SHP Builder and XCC Mixer. Attached SHP files to test both distorted save cases. Just save with the tool and view them. Fixed Encoding of 2 and 3. 2's issue was that it was using a 0 based index as if it was a count of the pixels (So it was always 1 off). 3's issue was that it wasn't handling when there were more than 255 zero's together in a line (So the byte just looped around back to 0 when it hit 256). @tomsons26lv: I havn't extracted RA2 files yet. I will need to add a debug mode to the loading so it would store the frame headers if the app requested it (Currently headers are thrown away after they are used in the loading). to save it in compression 3. Make any SHP save in comp 2 and then test. Another SHP attached, this time it gets cropped and image is changed. Attached is a txt file displaying the header information of the SHP's i have (768 or something, most from TS). @tomsons26lv: I still don't see how Compression(Byte) is part of a flag. Each frame which has Compression as a value other than 1, 2 or 3 has its width/height as zero. I haven't seen any frames which use any other values and which also have a width and height. I am also doubting that Radar Color is RGBA. RGB is used but A isn't except on some odd ones. It may be the 4th value is actually something else. Right so figured out more pieces to the puzzle. The first byte of Flags is checked during runtime by a function that decides what Blitter to use. or maybe it's even just raw image data being blitted not sure. Might be the only two that exist. RLE might have variations. i think the game decides what blitter type(RLE or orther) its gonna use on the first read for each frame and never re-decides again. Yea the Flags are 4 bytes, traced the header in memory its read at 0069E920 - mov al,[eax+08] by the blitter. @tomsons26lv: That would suggest it has nothing to do with the other 3 Bytes. If i change the first byte in the game memory it doesn't crash but it renders a corrupt shp on some values, i think the game decides what blitter type(RLE or orther) its gonna use on the first read for each frame and never redecides again. Sounds like it stores the compressed image in memory and just renders directly from it (as in never storing an uncompressed image). It would make sense as thats what you would expect from the game so that rendering is faster and memory usage is lower. 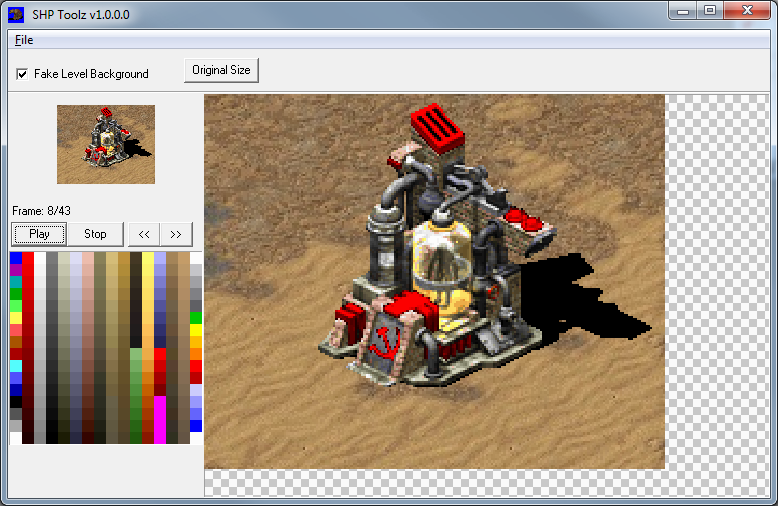 Compression 3 for example would allow the render to completely skip drawing some pixels. Sounds like it stores the compressed image in memory and just renders directly from it (as in never storing an uncompressed image). It would make sense as that's what you would expect from the game so that rendering is faster and memory usage is lower. 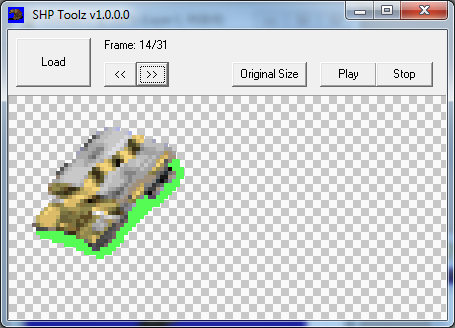 Compression 3 for example would allow the render to completely skip drawing some pixels. Yea seems the blit code processes it as needed in the process if RLE is present handling that. There is some SHP's which use it. Though its ones where the width is like 1, 2 or 4 (For that frame's area not the SHP Width). The following is my idea for an Open Dialog (Click it for larger image). Unfortunatly i couldn't get the Modern Shell ComboBox thing to work so currently using horrible Windows 3.1 style directory listbox. 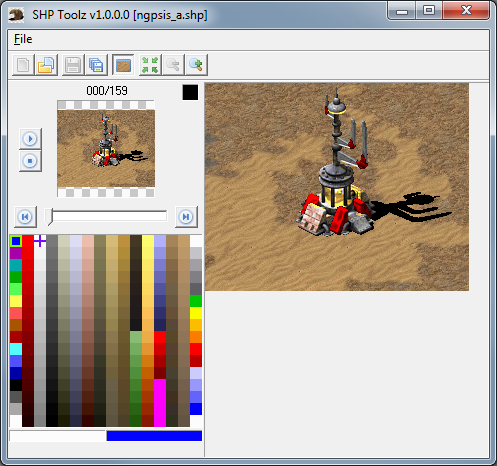 The SHP's are loaded (Only first frame and only once) when the EasyListView component needs to render a image so it will only load whatever is within view. 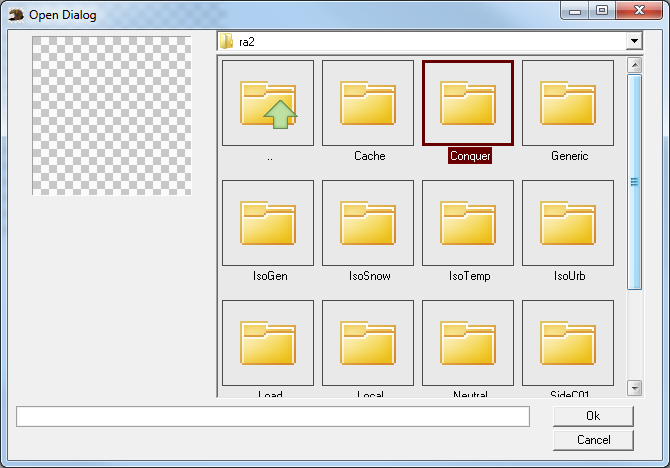 I have a idea, can you make a small app with drag and drop support that should show files as raw 8 bpp image? There aren't that many apps out there, 7yuv infact is the only decent one i've found but it isn't freeware. It is actually usable, you just have to double click the folders to change (And it then updates). fog.shp is not compressed. 0 and 1 are the same. So far there are only the following values: 0, 1, 2, 3. No SHP i have tried loading from TS/RA2 is triggering the breakpoint i have in the code if another type is used (Ones with other values have no size). I have noticed that some of the random SHP's i have use 0 but the original's don't so they are likely saved by a 3rd party editor like SHP Builder. I guess the test would be to use a SHP saved with compression 0 in TS/RA2 and see if it looks as it should. If so 0 is the same as 1. So that's that, confirms the game decides what blitter to use via those flags, no idea how that works tho but seems the flags are known https://github.com/Ares-Developers/YRpp/blob/master/GeneralDefinitions.h#L1307, well some of them, but i think those are internal values, not what the shps have. Doesn't prove SHP's have flags (Not saying they don't as the 3 bytes after the compression byte sometimes has a value). From what i can tell that code is "linking" directly to the memory of the game and using its procedures/functions (Or overriding). In re-guards to the combobox, i have found the issue with the ShellComboBox and its actually an issue with the ComboBoxEx screwing up when Insert is used.... The dropdown has a different set of items(Its overwriting values instead of inserting) due to it. No clue why. I have fixed it by storing all the items in a list, clearing the items from the combo, inserting into list and then building the combo's items from the list. Its an over the top solution but it works and wasn't hard to implement. Note that the ShellComboBox doesn't do exactly what you want. May be possible to implement what you want into it without wasting alot of time on it. Then tell me how to detect which mode to use? Cos its not a flag. Flags store each value on DIFFERENT bits. Its the only way flags work. 1+2=3=Not Flag. The whole point of flags is to store multiple boolean values inside a number(each one being a single bit). Also 01 and 02 exist in official ww shp's (As in ones with actual data) so i don't see how they can claim Format1 and Format2 don't exist.